The world can be a dirty place. I’m not just talking about mud in a rainstorm or litter in a park. Human beings produce an amazing amount of trash, and no matter how wonderful your protocols, that dirt is going to find its way inside. Your floors are going to get muddy and dusty, and debris is going to collect in the corners. This is just the way of the world. The paradox of all of this is people don’t really like to live or work in dirty places. Employees are more productive in clean environments, and patrons tend to spend more money when the store is spotless. In other words, whether you’re running a retail space or an office space or a warehouse space, it’s in your interest to keep that space as clean as possible. When it comes to keeping large areas clean — or small areas spotless — the broom and dustpan technique begins to lose its luster. In most cases, a manually operated broom or mop simply can’t keep up with mess created in larger spaces. Additionally, even the best of mops have trouble with smaller but heavily trafficked areas. The solution to these problems, then, comes in the form of a sweeper or scrubber, specially designed machines available in varying sizes that are prefect for cleaning or scrubbing large areas. While they share a similar task — keeping your floors clean and sparkling — and while they operate under similar principles, scrubbers and sweepers are, indeed, different instruments designed for distinct tasks. It’s important to know the differences in these machines before you decide on your rental, as renting the wrong machine can set you back both in terms of staffing and in terms of finances. A sweeper is designed, basically, for dry tasks. Typically, sweepers will have two revolving brushes — sometimes covered by the machine, but sometimes free — and these brushes rotate in opposite directions, pulling debris and dirt and dust into the sweeper’s interior hopper, which functions much as a dustpan does in your own kitchen. Some sweepers, called vacuum sweepers, also have suction options. Most of these models are walk-behind models, whereas sweepers more broadly can come in driven models and walk-behind models. Floor sweeper rentals can help ensure you get the best machine for the job. When it comes to deep cleaning or wet tasks, a scrubber is your best bet. A scrubber is a machine designed to handle deep cleaning tasks. Instead of simple brushes, as seen in the sweeper, scrubbers have a complex set of bristles designed to promote scrubbing. These bristles are usually consolidated onto a brush, of course. 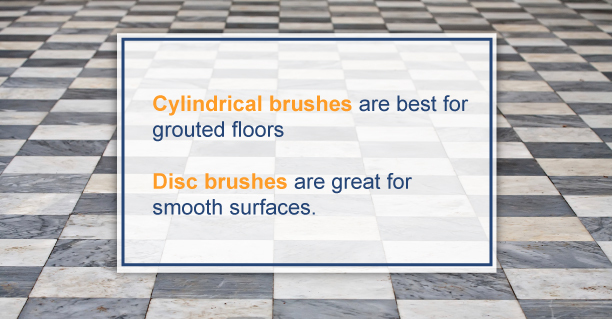 Disc brushes are great for smooth surfaces. Floor scrubber rentals can help make sure you don’t accidentally get the wrong machine. Sometimes, however, you find yourself in need of a scrubber and a sweeper. In many cases, simply renting both machines will be the best possible way to handle that situation. However, there are also combination machines available, called, appropriately enough, sweeper/scrubber machines. Once you’ve decided on the type of machine to rent, you’ll also need to settle on the size. As mentioned above, sweepers and scrubbers are generally available in both walk-behind and driven models. Obviously, not every model is suitable for every task. You can’t drive a sweeper through an office building, for example. You’ll want to be sure the type of sweeper, scrubber or sweeper/scrubber you have in mind will work for the space that needs cleaning. What’s the Best Way to Get a Sweeper or Scrubber? As with any large-scale specialized machine, however, scrubbers and sweepers can require a capital investment. They can be expensive. Not only that, but sweepers and scrubbers can be quite cumbersome and large — and if you want one, they require a large amount of storage space. If you use a sweeper every day, maybe this makes sense — but most people use sweepers and scrubbers only periodically, as a kind of proverbial spring-cleaning tool. For many businesses, the ideal way to get your hands on sweepers or scrubbers is simply to rent them. Sometimes, there’s a little bit of resistance to renting, mostly because people tend to think about it in terms of real estate, an arena in which it’s almost always better to own. But equipment is different. Sometimes with equipment it is, in fact, better to rent than to own. There are some definite benefits that come along with renting a scrubber or sweeper rather than outright purchasing one. Purchasing a scrubber or sweeper is a definite investment, and it’s an investment you could be paying off for years. When you rent a scrubber or sweeper, you pay only for the time you use it. The terms of this rental can be quite liberal — a couple of days, a couple of weeks, and so on. There are short-term and long-term options. If your use of the scrubber or sweeper is relatively rare, then you can better control your costs and expenditures by only paying for the machine when you actually use it. Rentals also help you control costs in another way. 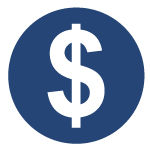 One of the largest costs associated with owning a piece of equipment is the cost of maintaining it. 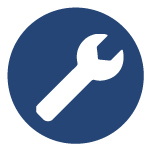 Just as your car or truck requires regular oil changes, belt replacement and tire rotation, any piece of equipment that does regular work is going to need maintenance. When you rent a sweeper or a scrubber, you avoid having to pay many of these service costs, ultimately saving you a great deal of money along the way. 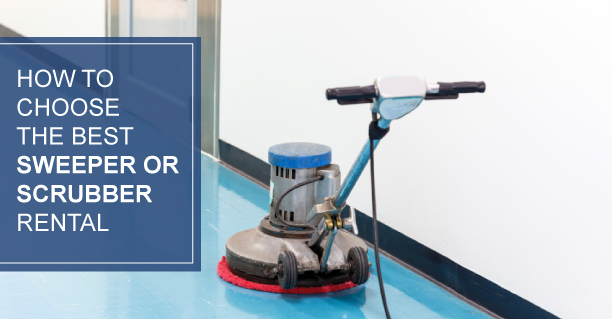 By saving on maintenance costs, you can actually end up using the scrubber or sweeper more often, ensuring you have a clean work space, retail space or warehouse space. Even with excellent maintenance, machines will eventually break down. These breakdowns can be quite unpredictable in nature. So if you own a sweeper or scrubber, and your machine breaks down in the middle of a cleaning task, this can set you far behind schedule. When you rent a sweeper or a scrubber, you’re ensured you will have a working machine for the duration of time you’ve decided to rent. In other words, you can reliably plan to get your work done — which will save you both time and money in the long run. Now that you’re comfortable with your decision to rent, it’s time to get into the nitty gritty of getting a machine in your hand. The rental process at Bortek is relatively quick and painless, but there are steps most customers take that help ensure they’ve made the best choice possible. The first of those steps is, simply, deciding on which sweeper or scrubber, or combination of the two, is the best fit for their needs. Once you’ve decided on the type of machine you’re going to require, it’s time to move to the second step in the rental process. And this second step is, actually, quite a bit easier than the first. We assume you’ve been browsing through sweepers and scrubbers on our website, so we’ve created an area where you’ll be prompted to do one of two things. Request a demo: Sometimes you have to see it to believe it. We get that. We embrace that. That’s why you can request a demonstration of any of our sweepers or scrubbers from this area on our website. We just need to know what piece of equipment you’re looking at and the results you’re looking to achieve. 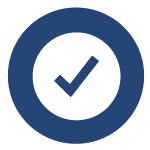 After you fill out all the contact information, we usually get back to you in an hour or so, at which point we’ll set up a mutually convenient time for a demonstration. Request a quote: It’s not always easy to anticipate how much a given rental will cost you, and in order to make an informed decision, that’s something you need to know. We’ve crafted our online experience so that, if you have some basic information about the job at hand, such as square footage, the type of machine you’re looking into and so on, we can provide you with a relatively accurate quote in order to help give you an idea of how much your rental will run. If you’re happy with the demonstration and the quote, then it’s time to move on to the next step of the process. Once you’ve signed the paperwork for your scrubber or sweeper, it’s time to get the machine in your hands so you can do the work you’ve set out to do. The logistics of this will usually depend on the type of machine you’ve decided to rent and the length of the rental period. When you rent from Bortek, you will get on-time delivery from us. In other words, when you rent a piece of equipment from us, we bring it to you. This means you can start your job on time. When you’re ready to have the scrubber or sweeper picked up, that can be arranged as well — we’ll come and pick up the piece of equipment. After all, our goal is for the rental process to be as easy and painless as possible, so we’re happy to pick up and deliver sweepers and scrubbers that are being rented through Bortek. When it comes to warehouse cleaning equipment or industrial cleaning equipment or factory cleaning equipment, purchasing the needed machine can be a huge investment. Frankly, your list of cleaning tasks may not justify that kind of investment. But you still need a clean space. The solution, then, is to rent a sweeper, scrubber or sweeper/scrubber combination from Bortek. The advantages of renting go far beyond a nice, clean floor. When you go with floor sweeper rentals or floor scrubber rentals as opposed to purchases or leases, you get a wonderful sense of peace of mind. The machines are delivered to you when you’re ready and picked up when you’re done. You don’t have to carry all that collateral on your books. And you don’t have to find a place to store your equipment when you are not using it. When you rent a scrubber or a sweeper, you also do not have to pay for maintenance of the machine, which over time can amount to a staggering figure. Whatever job you’re considering, whether you’re looking to keep your warehouse clean or your office area tidy or even if you’re looking to sweep a street after the turn of winter to spring, it’s worth looking at the wide variety of sweeper and scrubber rentals available at Bortek. You can search for sweepers and scrubbers and, once you’ve selected the right one for your job, take advantage of Bortek’s easy-to-use interface to set up a demo or schedule a consultation. Remember, nothing reflects on your workspace quite as much as the cleanliness of the floors.